How to manage projects has evolved in the 85 years since the Empire State Building was built. Dozens of new strategies have been – and are being – tested, but no silver bullet has yet been found. We are still searching for a solution to two apparently mutually exclusive conditions: Owners want certainty and minimal risk, and designers and builders know there is no certainty, and also want minimal risk. Fragmentation of responsibility, which I discuss in several other parts of this site. If I had to pick a point that marked the end of the so-called “master builder” era, it would be the construction of the first steel framed building, the Rand McNally Building in Chicago, in 1890. From that point forward, structural engineering started to become a distinctly separate profession. The Concrete Institute was founded in 1908 in the UK, and in 1922 was renamed the Institution of Structural Engineers. Other engineering disciplines followed, as design solutions became more complex and had more “working parts”. 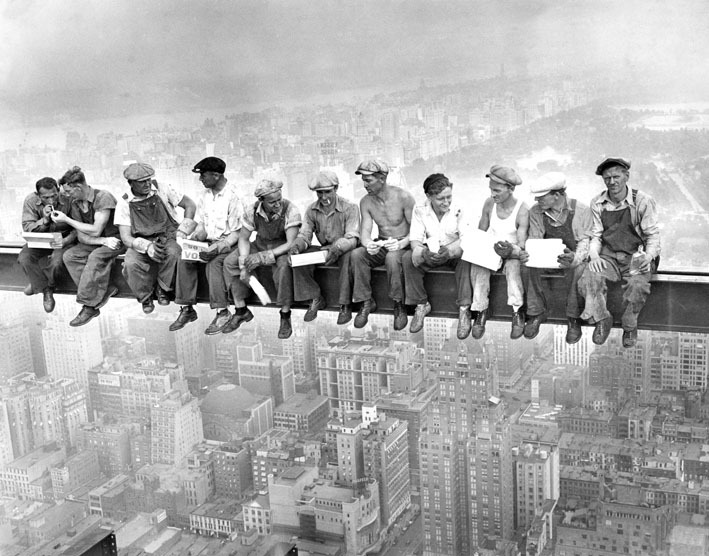 Safety and the rise of construction unions: The classic photo of a bunch of Empire State Building workmen having their lunch on a steel beam, hundreds of meters high, with no safety provision, is unthinkable today. The union movement is largely responsible for site safety, but is also largely responsible for creating massive cost surcharges on construction through their often-militant control over site conditions that range far beyond safety issues. The gradual elimination of redundancy in design, particularly in structures. A century ago, and going back a few thousands of years before that, most structures were designed to have high factors of safety: both labor and materials were cheap, and over-design was quite simply cheap insurance, paid for by the client. Reduction in factors of safety is the result. The advantages to both the client and the environment are obvious, but the risk consequences of redundancy elimination are very real: there is no room for error. The rise of project management as a separate profession. PMI (Project Management Institute, www.pmi.org) was founded in 1969, and with currently 2.9 million members all over the world, is the fastest growing profession on the planet. The second largest PM association is PRINCE2 (Projects in Controlled Environments), a UK organization started by the UK government in 1989 as a method of managing IT projects. It was spun off as a generic proprietary business in 1996. Unlike PMI, PRINCE2 does not have a membership base, but rather licenses trainers around the world, and certifies practitioners. The microchip and the internet, which have completely changed the way projects are delivered: Global participation in the development and delivery of projects is growing rapidly. The internet-based information revolution, which has created a range of opportunities not available just a generation ago – chief among them the rise of the web-based “project office”. The current project delivery “flavors of the month” – BIM (Building Information Modelling) and IPD (Integrated Project Delivery) would not be possible without the last two of these changes. Rethinking the Project Delivery part of architecture is a lot more complicated than rethinking the other five main functions of a design business, because suddenly a “cast of thousands” appears, with complex webs of mutually incompatible objectives. Nevertheless, a constructive rethink of project delivery has to be part of any effort to recalibrate design professionals’ influence over the conditions that will determine their future relevance: If we can’t offer our clients authoritative advice on delivery, others will do it for us, and they will be holding the aces for the rest of the game. Safety and the rise of construction unions. Site safety increases construction time and cost, but is necessary and justifiable. Many other construction union agendas also increase construction time and cost, unnecessarily and unjustifiably. This won’t change; any advances (such as off-site prefabrication) that reduce construction time and cost will amount to declaring war on entrenched and powerful interests. The solution to this problem requires political courage; for the time being I won’t address it further. Elimination of redundancy: In highly redundant systems, if a component fails, others cover for it and protect the system. Eliminate redundancy, and if a component fails, the system goes down. That’s a risk to designers. Proponents of the Lean Construction approach argue that it can achieve significant savings in project profitability, cost reduction, productivity, higher quality, better life-cycle performance, and other great outcomes. Importantly, these benefits can only be achieved by working at the process level, not just looking at outcomes. Project management as a separate profession. See Dealing with Independent Project Managers. Is “faster – better – cheaper” really a new idea? The construction drawings for the 103 story Empire State Building were completed in just two weeks, by Architect William Lamb of Shreve, Lamb and Harmon, and utilized previous concepts from the Reynolds Building in Winston-Salen, North Carolina, and from the Carew Tower in Cincinatti, Ohio, designed by W. W. Ahlschlager & Associates. The structure was the world’s tallest building for 40 years, until surpassed by the World Trade Center in 1970. An estimated 34,000 workers completed the project in just 15 months, 3 months ahead of the expected completion date. 5 workmen died during construction, which seems modest given the non-existent safety provisions! Let’s compare that with a modern project I’m quite familiar with – the 55-storey Melbourne Central – having worked on it for 5 years; 1986-1991. The project was fast-tracked, and design took approximately 3 years, involving multiple prime design consultants. Below: The “cone” over the historic shot tower in the Melbourne Central atrium, the largest structure of its kind in the world.